Are your children K'NEX fans? We've loved the K'NEX brand for years, I even remember my younger brothers receiving their very first K'NEX sets! It's important for children to build, learn and explore, K'NEX allows your child to do just that with their building sets! K'NEX Brands was founded in 1992, they have won over 270 international awards and recognition, they are one of the world's integrated construction systems for children. K'NEX encourages youngsters to imagine, build and play from the comfort of your home all the way to the classroom. K'NEX offers building toys for every age group and skill level, your child will have no problem falling in love with K'NEX! I recently received the K'NEX Stompz Building Set Beasts Alive for my children, this unique set brings the dragon to life right before your eyes! This set includes over 350 Classic K'NEX parts and a motor, it's recommended for ages 7+ and does require 2 "AA" batteries which are not included. The K'NEX Beasts Alive does take some time to build, but with the step by step directions and pictures included, K'NEX makes it a breeze! Along with the terrorizing dragon, this set allows you to build two other Stompz. Your children will love watching this creature come alive, once your dragon is built, turn on the motor and watch him go! He can stomp forwards or backwards and his tail swings from side to side - this is one cool beast! So what do you think? Isn't the Beasts Alive pretty cool? I think this set would make the perfect gift for any youngster! You can purchase K'NEX Stompz Building Set Beasts Alive online for $39.99! 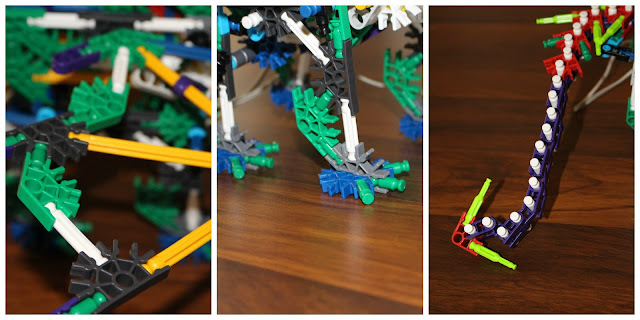 Be sure to stay connected with K'NEX on Facebook, Twitter, Pinterest and Instagram! But wait, there's more! Want to check out Beasts Alive in action? Watch the video below!